Description: The panel will explore and debate the wide range of gender and communication issues hitherto omitted from past considerations of the CSW Review theme. The panelists will make the case for the centrality of communication in broader struggles for gender equality and women’s human rights, as well as for the achievement of the Sustainable Development Goals. Issues such as gender equality in media decisionmaking positions, media policy, gender and freedom of expression and the rights of women media workers will be discussed, identifying key areas for action and practical recommendations for media and ICT companies, Member States, civil society and others. 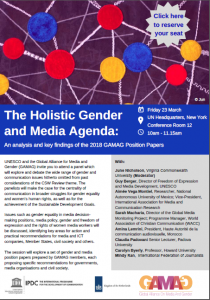 The session will explore a set of gender and media position papers prepared by GAMAG members, each proposing specific recommendations for governments, media organisations and civil society.